Since there are so many references to Heathcliff and this book in Eclipse, I thought I would read it before Breaking Dawn comes out. I thought it might help me come up with some ideas for what might happen in the fourth Twilight book - boy, was I wrong! 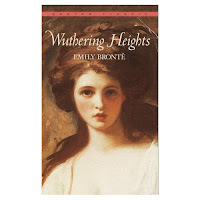 Wuthering Heights is a not your typical love story. It's twisted and the characters are despicable. I really just didn't like them at all and wanted to badly for any one of them to redeem themselves in the end. That being said, I still couldn't put this book down. There is something about it that draws you in. I read it fast and couldn't seem to put down the dark novel. It was almost like when you see an traffic accident you always find your self looking- I had to look and finish the book, even though I knew it wasn't going to be pretty. I am giving it four stars because the characters and plot were so complex it made such a great novel, and for the fact it was so well written that I just couldn't put it down. I did rent the movie from the library and tried to watch it after reading it and only made it 30 or 60 minutes in before I had to turn it off. I couldn't see the horrible characters in real life. It just made me sad. As far as predictions for Breaking Dawn? If Meyers is comparing Edward to Heathcliff like I think she is in the 3rd book, I think that readers are in for bad news in the fourth book. I hope that doesn't happen, because as much as I like Jacob instead of Edward, I think too many people would be upset if it ended similar to Wuthering Heights. Reading this book made me want to get back out Eclipse and read each passage that referred to Wuthering Heights. It's packed away in a box somewhere and will just have to wait. Don't read Wuthering Heights if you want a love story like Twilight, but do read it if you enjoy dark, suspenseful novels. Hey debbie, I wasn't sure if you would get my comment if I didn't post it on the first one, but my comment is about The Host. I am so glad I read what you said because I totally agree! It took me along time to get into the book, about half way. I also felt like things moved so fast! At first Wanderer was doing fine suppressing melonie and then Bam she was out of control. And I agree with the Jared memories too. I thought, "wow, when did this happen! she only saw a few memories and now she is completely in love?" I didn't like that. The character I really loved was Ian! I wanted Ian and wanderer to be together so bad and I really didn't care about Melonie and Jared. Everyone else I've talked to (which haven't been many) said that they really liked the book, but I wasn't that big of a fan. I know that it had to have a happy ending but I thought that moving wanderer into a new body was weird. and if no one was in that body anymore, why did wanderer act like that person instead of just herself? That annoyed me. I was also confused with what happened to a species when the Souls left. The souls did not create more Host bodies for them to live in, so when the Souls left would that species be extincted? B/c when Wanda, Ian, Jared, and kyle were getting supplies and stayed at the hotel, Wanda saw for the first time two souls that had a baby. The souls only lived in the Host until it died and then moved on, so who is creating more host bodies? That whole part was really confusing for me. All in all is was just ok. When I was a teenager I thought Wuthering Heights was so romantic and I wanted someone to love me like Heathcliff loved Cathy. But reading it as an adult, I realized how psycho and scary he is!! I read this book every three or four years, then completely forget it, then read it again. It's not a bad life. The Bronte sisters are not my favorites but I try to read one every few years. I left a little something on my blog for you today. Thanks for all the reviews and book recommendations. My name is Danielle and I work at Sourcebooks--we publish quite a few historical novels (including a brand new sequel to Jane Eyre and The Pemberley Chronicles Series, which have been reviewed here). I would love to talk to you or Kathy about setting up more reviews of some of our historical and Austen sequels throughout this Fall Season. I think you guys have a great blog that reaches a great readership within the targeted audience for these books! Send me an email (danielle.jackson@sourcebooks.com)! I hope we can set something up. I've read Wuthering Heights twice and hated it both times. The first time I read it was a few years ago upon the recommendation of my sister because we both love Jane Austen. It was horrible. However, I can't leave a book unfinished once I start it, no matter what. The second time I read it was for book club earlier this year, after we finished the first 3 books of the Twilight series. I still hated it, in the same way you did. The characters are horrible, awful, evil people with no redeeming qualities whatsoever. However, I also liked it slightly better this time, for the same reason you did - the writing. I still fail to see why anyone loves this book and thinks it's romantic or that it's even a classic. Give me Austen any day.